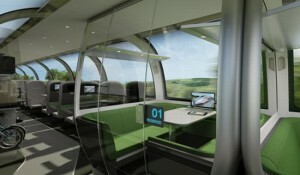 The 400 meter long train will travel at 225 mph /360 kph. The interior features regular commuter seats, designed to support in-transit entertainment, as well as private family rooms, a play area for kids, a lounge and a bar. Priestmangoode hopes to persuade the UK government to move forward as soon as possible with this project. They believe the Mercury is vital for Britain, both as a sustainable means of transport and as opportunity to put British design and engineering back on the map. One thing is sure, it will make travelling by train look good(e).